Breaking down day one in SoCal! Coverage of the Women’s Division at Santa Barbara Invite is presented by VC Ultimate as part of their season-long support of our women’s coverage. All opinions are those of the authors. Please support the brands that make Ultiworld possible and shop at VC Ultimate! 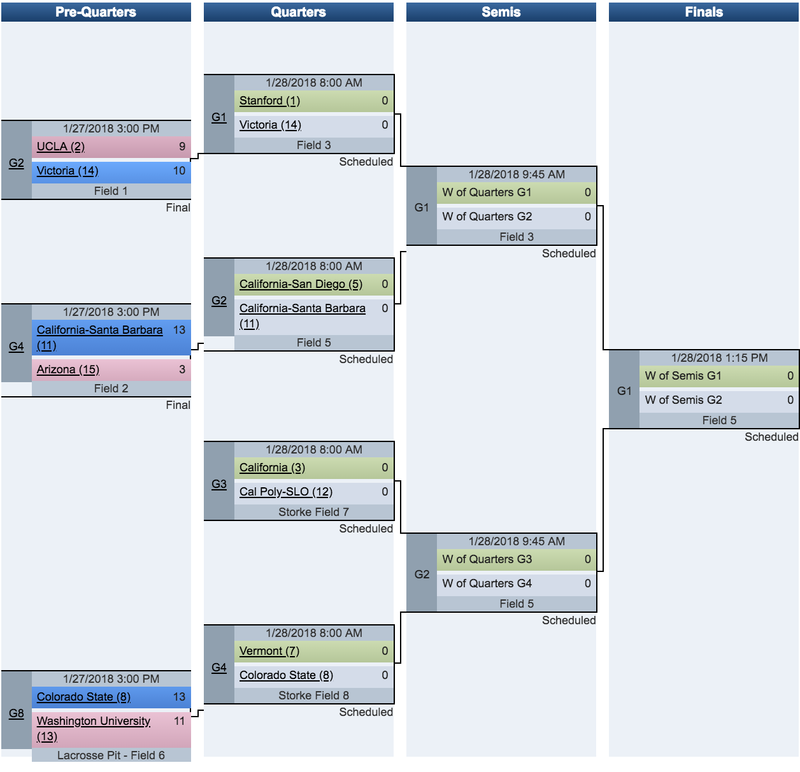 After a beautiful, sunny day of ultimate in Santa Barbara, the quarterfinals are set in the Women’s Division. Check out the bracket and our picks to buy, hold, and sell as we head into Championship Sunday! UCSB: The UCSB Burning Skirts were not featured in our 2018 college primer or our SBI preview. After one day of ultimate in Santa Barbara, they proved they deserve to be on our radar in a big way. The Burning Skirts finished with a 3-1 record and their only loss was a closely contested 11-9 game with Cal. UCSB came with a smart game plan and a disciplined offense. Julia Kwasnick, Kaitlyn Weaver, and Nicole Sun anchor a team that has been the surprise of the tournament so far. They have an incredibly tough path through bracket play on Sunday: a win over UCSD would only lead to a semifinal against Stanford, but the team has already proven themselves in pool play and could be the Cinderella story of the Southwest. Vermont: Vermont Ruckus’ 12-11 upset over UCLA in pool play today could be their meal ticket to another bid for their region. Vermont didn’t seem to shut out any teams today, but they earned the wins necessary to take Pool B and advance to the quarterfinals. Kyle Weatherhogg displayed impressive throws from behind the disc while cutters like Olivia Phillips proved to be well-rounded cutters. Don’t be surprised if you see Vermont in the semifinal tomorrow. UCSD: The UCSD Psychos stormed through pool play today with the efficiency and excellence of a team with far more elite experience. Along the way they broke seed, beating USC 13-4, and they finished the day with a better point differential than the no.1 seed Stanford. Kelli Iwamoto, Leanne Go, and Dena Elimelich dropped touch-perfect hucks into spaces ahead of their cutters. Stacy Tran had a nice day downfield for the Psychos as well. UCSD is a young team that plays with the chemistry and composure of a much older roster. Side Stack: When teams started stacking on the side at Bellingham Invite, it seemed like a flash in the pan. But today several women’s teams either set up pull plays from the side of the field, or they held a side stack as their primary offense. The side stack is coming for us all, people. The trend is real. UCLA: After a shaky day in pool play, UCLA lost in the prequarters to Victoria. A lot has changed in the nearly seven months since the 2017 College Nationals—in the seven months since UCLA convincingly made quarters and only lost to a Texas team that finished second overall. As of right now, BLU has a difficult task ahead of them if they’re hoping to make Nationals again. The team still has solid defense but is missing a cohesive offensive identity. We knew that UCLA was going to be rebuilding, but their loss in prequarters has made their inexperience far more evident. USC: The USC Hellions of Troy, seeded No. 4 overall, had a tough day. They lost early in a tight battle to Cal Poly-SLO 12-10 and then they seemed to crumble against the fast pace and close defense of both WashU and UCSD, losing each game 13-5 and 13-4, respectively. As a result, USC missed out on the bracket entirely, after making the semifinals last year. USC is clearly missing gears in their system, and younger players have yet to step into the core roles this team needs. Cal: There were a lot of questions surrounding Cal heading into 2018. Yet 2018 Cal is still athletic, aggressive, and voracious on defense. They won Pool C thanks to their athleticism, and the depth of the Cal roster is evident when points turn into a slugging match. Jackelyne “Kobe” Nguyen and Anna Wysen remain strong contributors, but their rookies have proven that they can fit in the Cal system and provide strong support. California has a strong team identity and play their own brand of ultimate. How far can they push on Sunday? BYU: BYU showcased a lot of raw talent and grit in their only day of play. While they held seed, they gave Stanford the toughest game of their Saturday, and they were one point away from upsetting Colorado State, who won 12-11 on double game point. BYU thrives on the talents of their stars like Kaylie Caldwell and Emmy Heller, and Jemi Ong had a great day, but the team doesn’t have the discipline to trust their plays or their system yet. Unfortunately, they won’t get another chance tomorrow. BYU has their sights set high, but they have some polishing to do. Comments on "Santa Barbara Invite 2018: Saturday Roundup And Sunday Bracket (Women’s)"